Forage Byron Bay is situated on 12 acres of land in Northern NSW between Byron Bay and Mullumbimby. We are very fortunate to have well established native trees on the property including Bunya, Quandong, Lilly Pilly, Macadamia and Davidson Plums. We are investing in a productive native edible garden with the addition of finger limes, Midyim, lemon aspen, orange berry, native Wampee, and native tamarind. Non native subtropical trees include pecan trees, white sapote, loquat, mangoes, lychee, longan, carambola, grumichama, guava, candle nut, jaboticaba and papaya. Due to our climate we are also experimenting with the growth and production of spice plants including cardamom, pepper, cinnamon, curry leaf, tamarind, vanilla bean, star anise, all spice and clove. New additions include a citrus orchard (including yuzu! ), figs, low chill stone fruit, quince, and avocados. And finally experimentation with dryer climate fruits such as pomegranate, olives, date palms, carob, and capers as well as colder climate options such as a black walnut tree. I am trusting in some micro climates on the property! Below is a guide (work in progress) of plants found on the property listed by botanical name, detailing the local harvesting season as well as resources for processing and cooking. Scroll down for a list of useful gardening resources. A 4-15m small to medium tree with dense dark green glossy foliage. Produces small yellow flowers Summer-Autumn, followed by the small pale yellow fruit Jan- mid April. Bears fruit within 4 years. The lemon aspen prefers tropical and subtropical rainforest conditions. It tolerates a large range of soil pH, although likes high rainfall and well drained soil. It will tolerate mild frost and drought although this will effect productivity. Susceptible to wind. Lemon aspen is susceptible to scales and sooty moulds. The topknot pigeon will eat the fruit. The fruit has a small season of 4-8 weeks and must be cold processed within 12-24 hours. Hand harvested. Up to 80kg/tree when mature. The fruit has a strong citrus/eucalypt flavour and can be eaten fresh. It can also be used in preserves as a syrup or cordial. It’s flavour is overpowered when coupled with citrus fruit. Also sold dried. The fruit is high in antioxidants, folate, zinc and iron. Recipes in development and will be posted in the blog under "Lemon Aspen". A tall evergreen coniferous tree growing 30-45m in height, with a tall straight trunk and dome shaped crown (flattening as the tree ages). Leaves are dark green and glossy and are very sharp. The Bunya tree heralds from the Jurassic era and can live for up to 500 years! A tree takes 10-15 years to mature and produce mature cones. They are hardy trees growing in a variety of soil and temperature zones (North QLD to Tasmania! ), although they prefer subtropical climates. Wind pollination occurs Sep-Oct with female cones taking 18 months to develop leading to nut production every 2-3 years in Dec- March in Northern NSW. Cones can weigh up to 15kg and are a hazard when falling (we wear helmets to harvest). We harvested in December 2017 with a low nut ratio and again in January 2019 which was earlier than I expected. Cones can produce over 100 nuts/cone. Our main problem has been bush rats and possums taking a good share of the produce prior to harvest! To open the cone - options include splitting a green cone with an ax or waiting for the cone to disintegrate (happens within 1-2 weeks of falling). It's easier to open the seed when young. There are many options including roasting the nut and allowing it to split open (beware exploding nuts), boiling and then cutting outer shell open or cutting the raw nut shell. This is the best method I have seen to date. The nut is gluten free and is comprised mostly of starch. It contains approximately 9% protein and 2% fat. 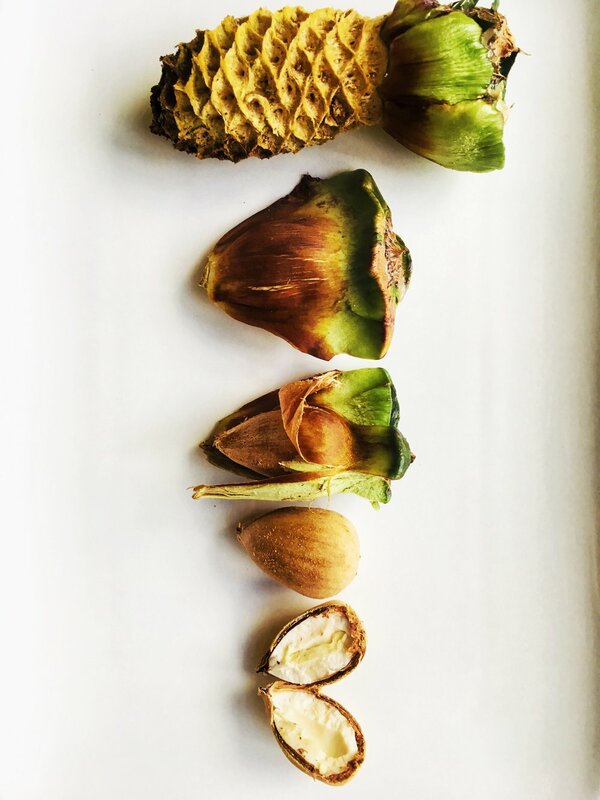 The Bunya has a significant place in Indigenous bush food history with many resources available on the internet. Recipes in development and will be posted in the blog under "Bunya". Small attractive evergreen shrub with fine dark green foliage, with mauve new growth, growing to 1m high. Leaves opposite rows with pale hairs on the underside. Flowers in Spring, producing small 7-10mm wide flowers with ovate petals. Likes sandy coastal conditions and a subtropical climate. Grows in full sun/part shade. Likes good drainage but adequate moisture. Does not like frost. Does not like harsh wind so needs a protected position on the coast. Propagated from seed in 3-4 weeks with no need for scarification. Also grown from cuttings. Watch for myrtle rust. Otherwise no known pests. Berries are hand harvested in late summer to autumn. Small white berries with pretty dots. Soft fruit with multiple hard small seeds inside that are too small to remove. Eaten fresh or preserved. “Blueberry with a hint of eucalyptus” is a good description of flavour. My favourite native berry. Recipes in development and will be posted in the blog under "Midyim". 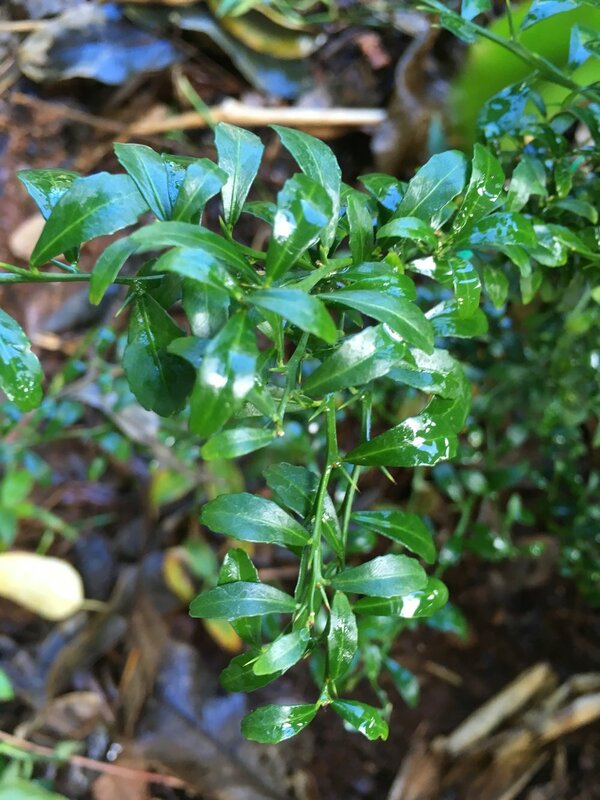 A shrub to 4m, w/ small dark green foliage, most with spikes. Native to subtropical coastal climate of Southern QLD/Northern NSW. An understorey tree that does not like sunburn or wind. Can be sun hardened as many local commercial crops are grown in full sun. Older tress will tolerate frost, younger will not. The finger lime flowers in June - October, fruiting at 3-4 years of age (some of mine carry fruit in their first year! )in December - May. Fruit are small, cylindrical or some shaped like a cumquat, with small contained vesicles filled with juice on the inside “caviar”. Sour tasting. The colour of the fruit varies – green, red, yellow, black and pink. Susceptible to regular citrus pests including aphids, mealybugs, caterpillars, snails, grasshoppers – can use white oil or pesticides. We have also seen the leather leaf slug destroy a plants foliage overnight. Gloriously not susceptible to fruit fly! Fertilise in Spring. Fruit has a shelf life of around 4-5 weeks or can be frozen for 6 months. A tall, skinny trunked tree with an umbrella of dark green furry leaved foliage at the top. It grows to about 10m in height. The Davidson Plum is a Rainforest plant with the jerseyana being native to Northern NSW. There are two other species – Davidsonia pruriens “Queensland Davidson Plum” that is native to North QLD, and Davidsonia johnsonii “smooth leaved Davidson Plum” that is local to Brunswick Heads/Tweed. We are growing all three varieties as the NSW and QLD Davidson plum fruit at different times of the year, and I am hopeful that if I can get fruit in Winter from the QLD plum, I may be able to avoid fruit fly that is a problem for the neighbour’s trees. The smooth Davidson Plum is endangered as it is seedless. They like deep friable soil with high organic material - they are planted into our rainforest zone here with a natural canopy and humus floor. They do not like frost when young, nor wind. They propagate well from fresh seed and need good water when young and for good cropping. Commercially they are planted 1.5m apart in rows 2.5-3.5 metres wide. The trees take 3-4 years to produce fruit, however don’t hit full production for up to 15 years. Fruit of the Davidsonia jerseyana grows directly off the trunk and forms oval golf ball size dark purple fruit that falls to the ground when ripe. They have lots of small hairs that can cause irritation. The flesh is burgundy red with two slender seeds on each side of the fruit that hold tightly to the flesh. Sour when eaten raw. Fruit is harvested around Christmas. Wild harvest of fruit is not permitted. A 4-8m tall evergreen shrub with dark green foliage, producing small scented white flowers, citrus like in appearance, ten stamen of alternating lengths, that appear in Spring. Flowers followed by clusters of translucent pink berries to approx. 10mm pitted by oil glands. Takes 2-5 years to fruit. Can produce fruit a lot of the year. Likes full sun, partial shade, best in tropical/subtropical climate, however will grow in coastal regions. Drought hardy however grows best with moist, well drained, soil. Propagates from fresh seed with flesh removed prior to sowing. This is a host plant for the swallowtail butterfly. Long fruiting period through Spring and Summer. The fruit is eaten fresh. Our plants are yet to produce fruit. Shallow rooted, sensitive to root damage. Phosphorus sensitive, don’t use phosphorus-rich fertiliser such as blood & bone or chicken manure. Use native fertiliser or citrus food. Surface application only. Don’t dig in. Have a look at this great resource for bush foods, including an interactive map to identify bush foods local to your area.